Last month the list of 10 nominees for the 2014 Poker Hall of Fame was released by the World Series of Poker, and now after the 21 living Hall of Fame members and a 20-member media panel have cast their votes, two finalists have been chosen. Daniel Negreanu and respected tournament director Jack McClelland have been selected for the Class of 2014 and will become the 47th and 48th inductees into the Poker Hall of Fame. The two beat out a list of finalists that included Bruno Fitoussi, Bob Hooks, Ted Forrest, Jennifer Harman, Humberto Brenes, Mike Matusow, Chris Bjorin and Huck Seed. In his first year of eligibility, Negreanu was considered a favorite for induction. The 40-year-old Canadian pro sits atop poker’s all-time money list with nearly $30 million in lifetime earnings, has six WSOP gold bracelets, two World Poker Tour titles, and is the only two-time WSOP Player of the Year. He’s also served as a member of Team PokerStars Pro and is largely considered one of the game’s best ambassadors. "It's an honor to be inducted alongside so many great players that have come before me,” said Negreanu. “An even bigger honor to be recognized at age 40, the same age as the legend Chip Reese. Thank you to the living members of the Poker Hall of Fame and those on the Blue Ribbon Media Panel that voted for me." 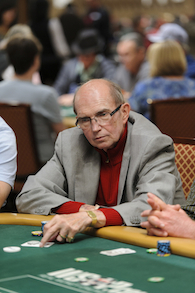 As for McClelland, 63, he is best known for his contributions on the operations side of poker. The one-time semi-professional bowler started as a dealer making $18 a day before working his way up to WSOP tournament director in the 1980s and then on to the Bellagio poker room from 2002 to 2013. Along the way McClelland, who retired last year, worked alongside three existing Poker Hall of Famers in Eric Drache, Jack Binion and Bobby Baldwin. McClelland and Negreanu will be inducted officially on Sunday, November 9 at 7:30 p.m. at Binion’s Gambling Hall, which is where McClelland served as tournament director and Negreanu won his first bracelet The Poker Hall of Fame Gala kicks off the November Nine festivities, taking place a day before the 2014 WSOP Main Event final table gets underway at the Rio All-Suite Hotel & Casino.